Despite the disasters of the battles of Jena and Auerstädt in late 1806, where more than half the Prussian Army was lost, the Prussian King Frederick William III refused to surrender to Napoleon and moved to East Prussia to continue the fight alongside Russian Tsar Alexander I. However when the Russians too suffered defeat, they and the Prussians made peace at Tilsit. Frederick William lost much of his territory, but instituted a series of reforms, including a major revamp of the Army’s uniforms, which were now to be based on the more modern Russian style. First announced on 12th November 1807, and introduced over the following months, the new look would define the Prussian Army for the rest of the Napoleonic Wars, including their final major actions at Ligny and Waterloo in June, 1815. That 1808 look as been modelled several times before in this hobby, generally very well, and this set largely matches those high standards. All the men wear the smart double-breasted tunic with high, open collar and short tails. Another modern item is the shako, which was generally covered when on campaign, as the large majority of figures here have done. Most of these figures also have the trousers with gaiters on the lower leg, but one man has no visible gaiters - variations such as this were certainly not unknown, so good to see here. Everything is correct, as are the ‘wings’ on the shoulders of the two musicians, but when it comes to the officer there is a problem, because his tunic has the same short tails as the men’s whereas it should have longer tails reaching almost to the knee. The officer also wears long boots and a sash, classic marks of rank in most armies of the day. So apart from the officer’s tunic the uniform here is quite correct. The average soldier would have a knapsack on his back and his greatcoat carefully rolled and placed round his trunk, which is what we see here. The knapsack is held by two straps with a cross strap between them on the chest, a detail added in 1810, so technically these men are kitted for 1810 onwards. 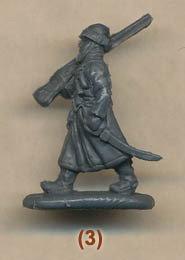 The rolled greatcoat had a leather ‘sleeve’ on the upper part, which again all these figures display, so no problems there. Each man would also have a cartridge pouch on his right hip, and many would have a bread bag or haversack on the left, which is correctly modelled here too, although the position of the breadbag does vary between left and right. One man has a visible water bottle, which is fine as these were normally carried inside the knapsack. A little surprisingly no one has a mess tin strapped to their knapsack, but of more concern is that every man has a short sword and bayonet scabbard suspended from a cross-belt over the right shoulder - another 1810 detail. This is a problem because Prussian infantry were not issued bayonet scabbards – bayonets were kept more or less permanently attached to the musket, as they are here, so while the error is small it is nonetheless an error repeated on almost every man. The drum is very nicely done, despite not being a separate piece, as is the flag, which is of the right size and mounted on a staff of the correct length with a spear finial. This is the largest set to date dedicated to just these soldiers on the march, and it must be pretty much the ultimate version as it offers a very generous 17 poses. 12 of the poses are of ordinary privates marching, all broadly similar, with the right leg forward, varying in terms of the precise position of the arms and sometimes in minor uniform or equipment details. While you can fabricate a column of marching figures from a single pose, the more such poses on offer, the more you will create a realistic group of men in fairly relaxed mood walking along. These figures deliver that very well, with every marching pose looking very good to our eye. The single poses certainly add to the effect, including a fifer playing, a drummer just walking, a man with a flag resting quite casually on his shoulder, and an officer. Generally colours would be cased while on the march, so presumably this man is expecting action or some other reason to display the flag, but other than that we also liked all these poses, which go a long way to complete the look of an infantry unit on the move. The sculpting of this set is at the top end of the wide Strelets range, which means it is very good indeed. Detail is plentiful and nice and clear, and both the faces and the hands are particularly fine. A few of the muskets are not as clearly detailed as the rest, but in general this is as good a sculpt as the comparable sets from Revell or HaT. We did find a bit of flash, but not much, and there was no excess plastic in any difficult places, so a good job of production too. To what extent the erroneous bayonet scabbards and the officer’s improper coat tails spoil this set will depend on you, but with lots of great poses and very good sculpting there is much to like here. 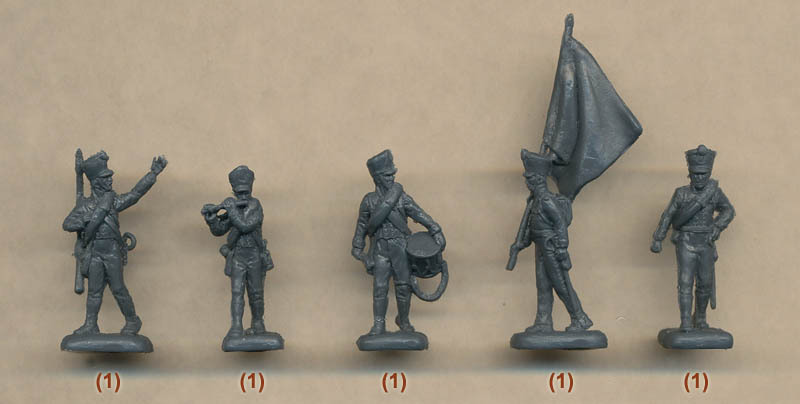 It is a comprehensive depiction of such men on the march, and for most customers it will be a very valuable part of their late-war Prussian armies.